It’s tax season once again and I’d like to address a question that I rarely see addressed: Who do tax cuts benefit? Taxes are, by and large, dues that run our country. We tend not to like them but we tend to like the things they pay for like education, public parks, security and defense, police departments, fire departments, trash collection, etc. Our tax system was designed to be a progressive tax system with the idea that we want to create economic opportunity for as many people as possible. The more people benefit from the efforts of our country, the more people should pay back in to help make sure future generations have the same opportunity. 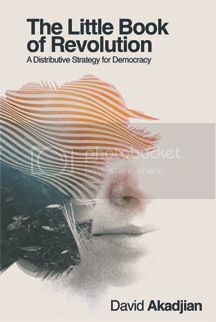 [The proverbial self-made man] is benefiting from the accomplishments of past generations, not to mention the support of public institutions (like the National Science Foundation) and services (like schools) that foster innovation and lead to greater productivity. With this in mind, let’s look at a simple way to evaluate these taxes. 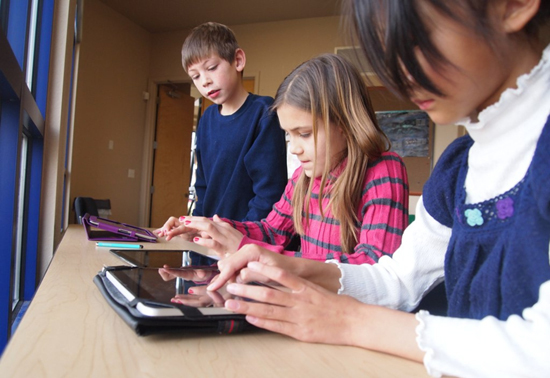 Students using iPads to work on projects by Brad & Lexie Flickinger (CC BY 2.0). Who benefits from reducing taxes? All taxes are not created equal. Some are progressive taxes, taxes where you contribute more as you do better, and some are regressive, taxes that impact people who aren’t doing as well more. Consumption taxes are taxes on goods and services that everyone buys regularly like food and gas. As you make more money, you don’t tend to buy more of these items so they impact everyone. Consumption taxes are regressive. Sales taxes tend to be consumption taxes unless they are on luxury items such as yachts or airplanes. Reducing sales taxes help consumers and everyone equally. Fees, tolls, licenses, and fines act similarly to consumption taxes. I’m going to assume that we all sin in some way, shape or form and include sin taxes as a consumption tax that impacts average people. Capital gains taxes affect the profit on investments. Cuts to capital gains taxes primarily benefit people who can afford to invest and disproportionately benefit the wealthy who hold most of their wealth in stocks. Estate taxes primarily affect the wealthy since there is usually a threshold below which there is no tax (at the federal level the threshold is $5.43 million in 2015). Taxes on luxury items also clearly impact the wealthy most as this is the group most likely to buy large luxury items. Corporate income taxes have to be paid by people since corporations are nothing more than pieces of paper. It’s often assumed that taxes on corporations are passed on to consumers; this is false. Prices are determined by supply and demand independently of tax rates. If this seems counter-intuitive, ask yourself if you’ve ever seen a price go up or down because taxes were raised or lowered. This leaves two groups of people: shareholders and employees. Most economists agree the costs of corporate taxes are borne by these two groups though they disagree on the ratio. If you look at a number of estimates and average them, it’s close to 20 percent labor and 80 percent shareholders. The tax policy center methodology estimates this same 80/20 shareholder to labor split. Using this 80/20 split, corporate tax cuts would mostly benefit shareholders which means they will disproportionately benefit stockholders or the top 1%. Payroll taxes are paid by both employees and employers. However, the economic burden of payroll taxes fall on workers as the employers’ share of payroll taxes is passed on to employees in the form of lower wages. Property taxes are a bit tricky also. You might think property taxes affect only people who own property and also impact the wealthy more as they own the most property. First, property taxes can be passed on to renters in the form of higher rent. Second, property owners have ways to reduce or offset the amount they pay in property taxes. For example, property owners receive an income-tax deduction for interest paid on their homes. The more interest you’re paying, the bigger the tax deduction. There are also often loopholes that allow people to declare their property a farm or some other type of business for a tax deduction. Long story short, property taxes are usually paid by average people. The United States and most states have a progressive income tax system. The idea is that as you make more and do better, you pay more back. For this reason, income taxes tend to be paid more by people who benefit more. 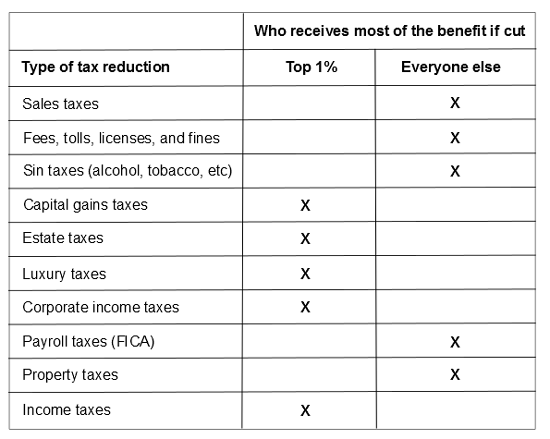 This example, from Ohio’s 2015-16 proposed income tax changes, shows who would benefit most from income tax changes, the biggest being a 23% rate cut. The top 1% would receive on average $13,096 while the next 4% would receive $1,395. Benefits drop off steeply for everyone else. Income tax cuts primarily benefit the wealthy. If we want people to benefit, we would reduce sales taxes, fees, tolls, licenses, and fines, sin taxes, payroll taxes, and property taxes. If we want to benefit the wealthy, we would cut capital gains taxes, estate taxes, luxury taxes, corporate taxes, and income taxes. What will it take to get the Dow Jones Industrial Average to a level of 3000 or 4000 by the early 1980s? Wanniski believed the U.S. could recreate the conditions from 1921 to 1929 under Calvin Coolidge that led to a nearly five-fold rise in the stock market. Coolidge believed “generally speaking, the business of the American people is business” and lowered taxes to the point where in 1927, only the wealthiest 2% of taxpayers paid any federal income tax. As in the 1920’s, we can expect a gradual, then accelerating dismantling of the government barriers between effort and reward. An era of incentives. The most important of these barriers are the now unnecessarily high federal tax rates on capital gains, personal incomes, and gifts and estates. Also a diminution of federal regulatory barriers to commerce. If you want the stock market to go up, the way to do this is to cut taxes on the wealthy and corporations (the capital gains tax, income taxes, corporate taxes, estate taxes, etc.). These taxes are taxes on accumulated wealth and capital. If you want to juice the stock market, eliminate taxes on accumulated wealth and capital. Certain tax cuts benefit Wall Street and the wealthy. Taxes that don’t fall into this category are the taxes paid by everyday people: sales taxes, property taxes, sin taxes, government fees and tolls. Look for these taxes to be raised. Wanniski’s article became one of the cornerstones of supply-side economics under President Reagan. Cutting these taxes doesn’t boost the economy. It doesn’t boost demand. It doesn’t create jobs. It doesn’t help the middle class. As Wanniski points out, these tax cuts benefit investors and juice the stock market. How well have we followed the Wall Street plan? In 1978, the Carter administration reduced the top tax rate on capital gains to 28% from 39%, reduced income taxes, increased the capital gains exclusion rate from 50% to 60%, and reduced the corporate tax rate from 48% to 46%. Across-the-board income tax cuts. The top income tax rate dropped from 70% to 50%; the bottom rate dropped from 14% to 11%. Raising the estate tax exemption to $600,000. These cuts were based on the idea that we could cut taxes and increase revenue through greater growth. Unfortunately, so much revenue was lost that Congress had to close several loopholes opened by the ERTA only a year later with the Tax Equity and Fiscal Responsibility Act (TEFRA) of 1982. For the nation’s work force, the Social Security tax is already the biggest tax they pay. In 1935 we were told the tax would never be greater than 2% of the first $3,000 of earnings. It is presently 13.3% of the first $29,700, and the scheduled increases will take it to 15.3% of the first $60,600. These tax increases on workers subsidized tax cuts for corporations and the wealthy, like the capital gains tax cuts and the estate tax cut. In 1986, in the second of Reagan’s two major tax overhauls, the top tax rate for individuals was reduced from 50% to 28%, while the bottom rate was raised from 11% to 15%. As a result of the trickle down tax cuts of the 1980s, revenue fell and the deficit rose. That led President H.W. Bush to raise taxes in 1990 to try to keep the deficit in check. In 1993, President Clinton raised the top two income tax rates slightly and raised the corporate tax rate 1% (from 34% to 35%). However, he also increased the share of Social Security benefits that could be taxed and raised the sales tax on fuel (a consumption tax that affects consumers more than businesses). In 1997, however, Clinton reduced the capital gains tax from 28% to 20% and raised the exemption on the estate tax to $1 million from $600,000. George W. Bush accelerated the push in 2001 and 2003 with more tax cuts heavily favoring the wealthy. The exemption for the estate tax was raised to $5 million and the rate reduced. The Center on Budget and Policy Priorities estimates that 24.2% of tax savings from these changes went to the top 1%. In 2010, the Bush tax cuts were up for renewal. President Obama fought to renew them for those earning less than $200,000 ($250,000 for joint filers). The U.S. Chamber vigorously fought leaving out those who earned more and eventually a compromise was reached where the original changes were extended for 2 years in exchange for some economic stimulus measures and a temporary 1-year reduction in the payroll tax. In 2012, the Bush tax cuts came up again. This time President Obama proposed making the tax cuts permanent for those with taxable incomes of $400,000 ($450,000 for joint filers) or less. For those above this level, the rate was increased from 35% to 39.6% and the capital gains tax was also raised from 15% to 20%. The payroll tax deduction from 2010 was eliminated. Using this very simple method of scoring tax cuts, it’s pretty clear who receives most of the benefit of tax changes in America. This is largely the result of corporate special interest group lobbying by groups like the U.S. Chamber of Commerce, the largest special interest group in the country. In 1952, corporate income taxes provided 32.1% of federal revenue. By 2013, corporate income taxes provided only 9.9%. 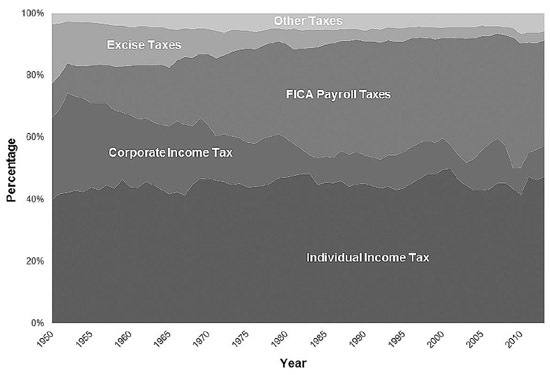 In 1952, FICA payroll taxes provided 9.7% of federal revenue. In 2013, FICA payroll taxes provided 34.2%. Excise taxes including the estate tax provided 19.1% of federal revenue in 1952. By 2013, excise taxes provided only 5.5% of federal revenue. If you score the tax changes at the national level using the table illustrating who they benefit, almost all of the tax changes have been designed to benefit the wealthy and Wall Street. Wanniski’s plan has come to fruition. Not surprisingly, Wall Street is doing quite well, average people are not. Benefits were supposed to trickle down – they didn’t. The rising tide lifted a few yachts but rolled right over most. National and state budgets and tax plans are not easy to decipher. Especially since most of the business reporting in our country is just that, reporting done by our largest businesses. The report? We’re doing quite well thank you and we’d like to pay even less to states and the United States. In Ohio, our state legislature is lowering income taxes and corporate income taxes and raising sales taxes, property taxes, sin taxes, and fees, tolls, and license costs. Everyone making $58K or less is being asked to pay more. The people who benefit the most are the 1%. The belief is that the 1% will invest and create more jobs. Anyone who’s taken even the most basic business courses knows that you hire people when there’s an increase in demand and taking money from consumers (70% of GDP spending) reduces demand. This situation won’t change until enough people mobilize for an economy that works for everyone, not just a few. Who will tax changes benefit? Will you be paying more as a result of these changes? Are we getting anything in return? Do we want a country where the only people who benefit from our economic output are owners and investors? This article initially written as a guest post at ChrisWeigant.com.